It’s good for local jobs, and it’s best to let sleeping dogs lie. Aerial imagery from Bing! maps. Awful name, nice mapping. I had a welcome email yesterday from top reader and contributor Andy Dennis. 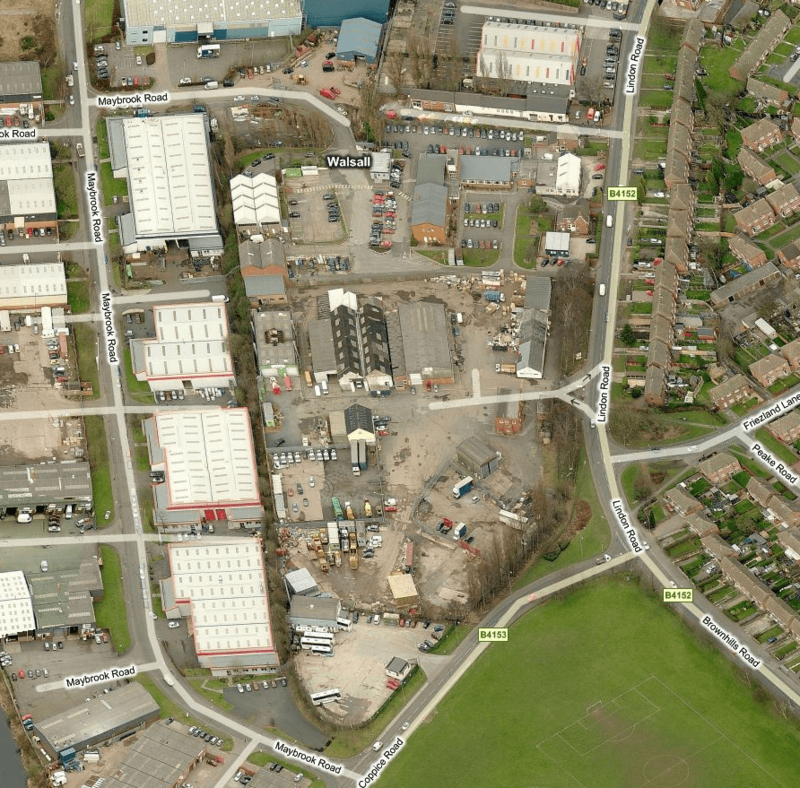 He pointed out that the appeal against the refusal of planning permission for the demolition of Brownhills Business Park and the construction of a housing development had now been dropped by the developers, Ashtenne Industrial Fund. The news was posted on Walsall Council’s Planning News Page. Regular readers with a good memory will know that I’ve been covering this matter for some time. The business park is actually the site of the former Walsall Wood Colliery, the shaft of which was used as a toxic waste disposal facility from the closure up until the mid eighties. I’ve always been of the opinion that building housing here would be daft, as the land must be highly contaminated, and few would wish to purchase a home sat above a mine with such a toxic history. We must, however, remain vigilant. This may well come back from the dead, particularly as the old Effluent Disposal/Leigh/Veolia site next door is now also for sale. Ashtenne Industrial Fund – has now withdrawn its long-running appeal against the refusal of housing on the occupied and active Brownhills Business Park Employment site. The original planning refusal of January 2009 therefore stands. This ends a long period of uncertainty for the occupants of the site and their workforce. Ashtenne appealed the refusal and an Inquiry was held, at two sittings in December 2009 and March 2010. The Government Inspector allowed the appeal in May 2010. However the Council then appealed to the High Court on the grounds that this decision was flawed. The Government and Ashtenne stated they would contest the decision. The Court dates were arranged for July 2011, but just before this, both the Government and Ashtenne withdrew from contesting the case, following the Council’s submission of documents that substantiated its reasons for considering that the decision was flawed. The Brownhills Business Park Inspector’s decision was quashed in August 2011. A new inquiry therefore needed to be arranged. Planning committee was advised about this at its meeting on 10th December. But on 21st December Ashtenne decided to withdraw the appeal. At least 70 jobs are now safeguarded as a result of Ashtenne’s withdrawal, at a time of great economic uncertainty. This is also good news in terms of the maintenance of the industrial land supply, and planning policies to safeguard and improve it. This entry was posted in Bad Science, Brownhills stuff, Environment, Events, Followups, Just plain daft, Local History, Local media, Local politics, News, planning, Reader enquiries, Shared media, Social Media, Spotted whilst browsing the web, Walsall community, Walsall Council, Walsall Wood stuff and tagged Andy Dennis, Ashtenne Industrial Unit Fund Trust, Brownhills, Brownhills business park, Brownhills local history, Derelict, Effluent Disposal Limited, Local History, Local politics, planning, Redevelopment, Silly, Toxic dumping, Toxic waste, Walsall, Walsall Council, Walsall politics, Walsall Wood, Walsall Wood Colliery. Bookmark the permalink. What put the developers off was that the Council’s argument that its policy to protect industrial land outweighs the regional plan (which calls for ridiculous amounts of new housing) would succeed in the High Court. So Ashtenne and the Government, who got it wrong, withdrew to avoid massive costs. An obscure technical point, maybe, but that’s how the planning and legal systems combine in some contentious cases. The Council shoud still be able to recover its own costs. It’s not every Council that has officers who can take on the Government and win, so this is some feather in heir cap. And it’s not the first time. Contamination can usually be overcome or managed these days because the value of housing development will cover the cost. This is often not the case for industrial development, which is generally far less lucrative. Although this particular estate is not especially glamorous, not everyone can afford the rents on new build estates, such as round the corner in Maybrook Road, typically 5 or more times as much. So, although there are people who would simply dismiss them as obsolete eyesores, estates like this (and I’m sure Bob sees plenty and much worse on his travels) are essential parts of the industrial economy.